I've been trying to come up with a post for today and it's been rough. As soon as I get this post out of the way I have given myself free reign to go clothes shopping. As in "I've lost weight and my pants are baggy so I just have to go use my Kohl's Cash + 30% off" kind of shopping. Somehow, miraculously, it paid off! 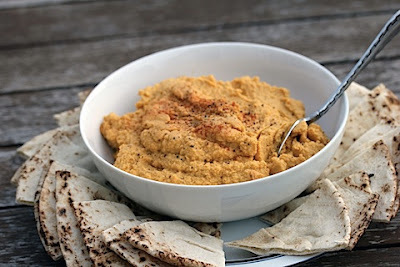 Can you send Rachel and I the recipe for your sweet potato hummus? Dear Grammar Police masquerading as my sister... I'd like to rephrase my question. Can you send me and Rachel the recipe? This way you won't have to pull me over for grammar negligence. I won't use the pepper spray if you don't butcher my language. You are obviously quite capable of using grammar correctly, so try it some time. Set a steamer basket in a large pot. Fill with enough water to come just below basket; bring to a boil. Add potatoes; reduce to a simmer, cover, and cook until tender, 10 to 12 minutes. Transfer to a food processor. Combine chickpeas, lemon juice, tahini, oil, cumin, and garlic in the food processor. Puree, about 1 minute; thin with water if necessary. Season with salt and pepper and let cool; refrigerate, in an airtight container, up to 1 week. Serve with pita and crudites. They have step by step pictures. So there you have it a yummy recipe and a mildly funny conversation. Kohl's, you devil, here I come!